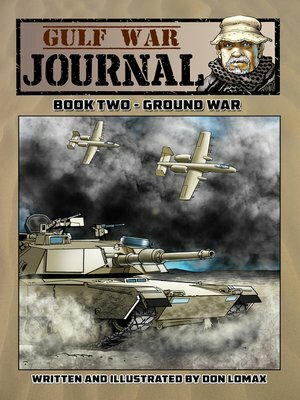 HARVEY AWARD NOMINEE comic writer and artist Don Lomax assembles his Gulf War comic series and brings back the central character from his critically acclaimed VIETNAM JOURNAL books. January 1991. The ground war to oust Saddam Hussein by United States and coalition forces from Kuwait has begun. Scott 'Journal' Neithammer has come out of retirement and finds himself and his photographer lost in the desert and many miles behind enemy lines. It soon becomes evident that danger takes more than one form as they are captured by Iraqi forces. But with escape comes the realization that friendly fire can make you just as dead as Saddam's army. Collects comic issues #5-9 of GULF WAR JOURNAL. "First rate...alternates documentary-style reporting with documentary-style fiction. One of the five best war comics." - Don Thompson, The Comics Buyer's Guide. "Stresses authenticity. Anyone who saw the real city of Khafji in Saudi Arabia will recognize landmarks in the comic book." - Ron Jensen, The Stars and Stripes.